ON THIS PAGE:You will find some basic information about this disease and the parts of the body it may affect. This is the first page of Cancer.Net’s Guide to Non-Small Cell Lung Cancer. Use the menu to see other pages. Think of that menu as a roadmap for this complete guide. Lung cancer affects more than 200,000 Americans each year. Although cigarette smoking is the main cause, anyone can develop lung cancer. Lung cancer is always treatable, no matter the size, location, whether the cancer has spread, and how far it has spread. Because lung cancer is associated with smoking, patients may feel that they won’t receive much support or help because they believe that others will think that their behavior caused the disease. The truth is that most smokers do not develop lung cancer, and not all people diagnosed with lung cancer smoke. Lung cancer is a disease that can affect anyone. In fact, most people who get lung cancer today have either stopped smoking years earlier or never smoked. When a person inhales, the lungs absorb oxygen from the air and bring the oxygen into the bloodstream for delivery to the rest of the body. As the body’s cells use oxygen, they release carbon dioxide. The bloodstream carries carbon dioxide back to the lungs, and the carbon dioxide leaves the body when a person exhales. The lungs contain many different types of cells. Most cells in the lung are epithelial cells. Epithelial cells line the airways and make mucus, which lubricates and protects the lung. The lung also contains nerve cells, hormone-producing cells, blood cells, and structural or supporting cells. There are 2 main classifications of lung cancer: small cell lung cancer and non-small cell lung cancer (NSCLC). These 2 types are treated differently. This guide contains information about NSCLC. Learn more about small cell lung cancer in a separate guide on this website. NSCLC begins when healthy cells in the lung change and grow out of control, forming a mass called a tumor, a lesion, or a nodule. A lung tumor can begin anywhere in the lung. A tumor can be cancerous or benign. Once a cancerous lung tumor grows, it may shed cancer cells. These cells can be carried away in blood or float away in the fluid, called lymph, that surrounds lung tissue. Lymph flows through tubes called lymphatic vessels that drain into collecting stations called lymph nodes. Lymph nodes are the tiny, bean-shaped organs that help fight infection. They are located in the lungs, the center of the chest, and elsewhere in the body. The natural flow of lymph out of the lungs is toward the center of the chest, which explains why lung cancer often spreads there first. When a cancer cell moves into a lymph node or to a distant part of the body through the bloodstream, it is called metastasis. 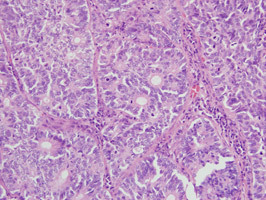 Adenocarcinoma starts in cells that produce mucus. Squamous cell carcinoma begins in the cells that line the airways. 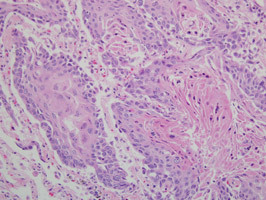 Large cell carcinoma begins in cells other than the 2 types described above. It is important for doctors to distinguish between lung cancer that begins in the squamous cells from lung cancer that begins in other cells. This information is used to determine treatment options. 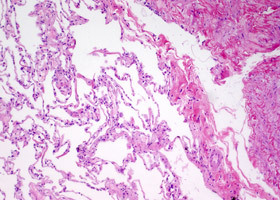 Images used with permission from the College of American Pathologists. ASCO Answers Fact Sheet: Read a 1-page fact sheet that offers an introduction to lung cancer. This free fact sheet is available as a PDF, so it is easy to print out. ASCO Answers Guide: Get this free 44-page booklet that helps you better understand this disease and treatment options, as well as keep track of the specifics. The booklet is available as a PDF, so it is easy to print out. Cancer.Net Patient Education Video: View a short video led by an ASCO expert in lung cancer that provides basic information and areas of research. Cancer.Net Blog: Read an ASCO expert’s opinion on what newly diagnosed patients should know about lung cancer. Cancer.Net En Español: Read about NSCLC in Spanish. Infórmase sobre cáncer de pulmón de células no pequeñas en español. The next section in this guide is Statistics. It helps explain the number of people who are diagnosed with NSCLC and general survival rates. Use the menu to choose a different section to read in this guide.